BLACK ORCHID EMPIRE is a three-piece Rock act hailing from London, and have been unleashing their ferociously tight show across Europe, including a UK tour with HED p.e, several headline runs and much-lauded appearances at Standon Calling, Planet Rockstock, Camden Rocks Festival and Taubertal Festival in Germany amongst others. Their critically-acclaimed debut album “Archetype” garnered widespread media attention, with single “God Is Awake” being selected as Kerrang! Radio’s track of the week. 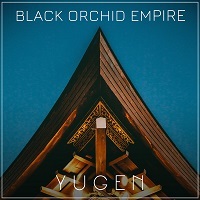 The band presents their sophomore effort here, titled “Yugen,” which contains eleven tracks. “My Favorite Stranger” kicks off the album, with fuzzy bass notes and a dark opening sound. The vocals are at first a bit ethereal, subdued with a dreamy sound. They crank things up in the chorus. “Burn” opens with a dirty riff and feature another big chorus. They aren’t re-inventing the wheel here in terms of the Hard Rock sound, but they do play with genuine love as you can hear it reflected in the music. “Celebrity Summer” opens with an airy passage, talking about how “everyone’s a sucker, and I’m just another mouth to feed.” It’s a good combination of easy listening passages and some that lash out a bit more. “Wires” opens with a steady drum beat, leading to a downtrodden riff connecting with minor chords. It goes low in the registry, which gives it a bit of an angry edge. “Blacklight Shadow” has the makings for a single, with expressive emotions and a tender sound at first that explodes in the chorus. The bridge after the second chorus is lively and full of energy as well. “Vertigo” opens with some great spacy keyboards, clean acoustic guitar, and introspective vocals. It could be considered a ballad of sorts, but either way, it’s a great sound. “Mouth of the Wolf” goes the opposite direction, cutting in with a fuzzy and hardened riff, in a slow grind. It brims with a firm energy that would seem to make for a good live track for sure. “Toru’s Maze” is all about the rhythm and the groove. It’s infectious and will beg you to turn up the volume while you are listening to it. “Years” is the closing song. Tender piano and vocals lead off the sound, in a reflective moment. But in looking at the present and future, he gets back up and dusts himself off repeating “I’m still yours,” in the steadfast belief that saying it over and over will make it true. Overall, I enjoyed the album. As I said before, they aren’t re-inventing the wheel when it comes to Rock Music, and that is fine. They are also not falling into an oft-used trap of trying to be someone else’s Rock band from the past. Indeed, they are themselves, and are making an honest name for themselves in the industry. There were many very enjoyable songs here so give it your time.